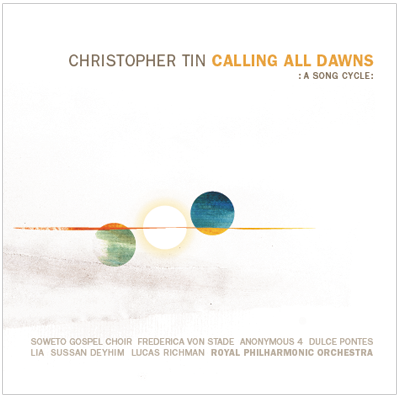 It's nice to flex my non-stationery design muscles every now, and in this case, it came in the form of a CD design for composer Christopher Tin's Calling All Dawns, a beautiful album that defies a genre classification but would likely be categorized as "world music." It consists of 12 songs/ 12 languages / 3 parts (day, night, dawn). With such Grammy nominees and winners like Frederica con Stade and the Soweto Gospel Choir gracing this album, it's a deeply moving listening experience. 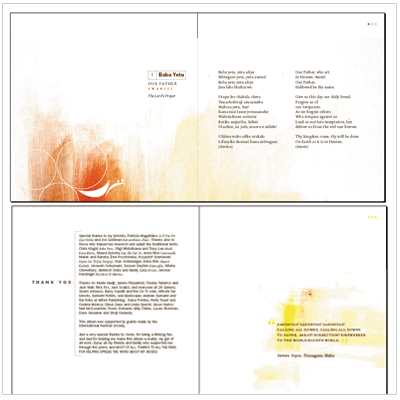 Below is the cover art and some miniaturized versions of the layouts I designed for the album. And yes, I did use Stefan Hattenbach's typeface Delicato for the text. Album becomes available today!